Around the year 75 BC, warfare between the Nephites and Lamanites began to evolve. Only recently in documented Nephite history, the commander of the army was separate from the highest political official. That commander was a young man named Moroni, who employed innovative strategies of defense in warding off invading Lamanite armies. One of those innovations was extensive fortifications throughout the land of Zarahemla (Alma 50:1–6). Earth/dirt was “heaped” up into a “ridge” or wall “round about” the city; sometimes a “breastwork of timbers” was used to reinforce the inside of the earthen wall; in at least one instance, stone was also used to build the wall (Alma 48:8; 49:4, 18; 50:1; 53:3). Naturally, the displacement of dirt created a “ditch … round about” the outside of the wall or bank (Alma 49:18). A timber palisade, picket, or parapet on top of the earthen wall (Alma 50:2–3). Towers above the timber picket, with bastions (“places of security”) atop the towers, from which defenders of the city could safely “cast stones … and slay him who should attempt to approach near the walls” (Alma 50:4–5). Fortifications of a similar nature are known among many ancient cultures, including some in pre-Columbian America. According to Ross Hassig, “during the Late Formative,” also called the Late Preclassic period, “the general sophistication of warfare in Mesoamerica increased.” This naturally “spurred the development of defensive architecture” during this time period. A pair of Mesoamerican archaeologists agreed, “Defensive features,” on archaeological sites, “appear to have been more prominent, though far from prevalent, during the Late Preclassic (300 BC to AD 250),” noting, “significant transformations in conducts of war appear to have taken place during the Preclassic period.” John L. Sorenson documented a minimum of 56 Late Preclassic fortifications, as opposed to only five from earlier time periods. More than just documenting the rise in fortifications, however, Sorenson made note of their features in each period. Features documented at Late Preclassic fortifications include: (1) earthen barriers and occasionally even stone walls; (2) a ditch or moat; (3) wooden palisade; (4) isolated guard posts, and towers from which stones and other projectiles could be launched at invaders. For example, the defensive earthworks at Becan (ca. AD 100) involved a ditch with an average width of 16 meters, and earth embankment approximately 11 meters high on average, from the bottom of the ditch. Archaeologists suspect a wooden palisade was built atop the embankment, from which stones and perhaps other projectiles were thrown at enemy attackers. The few fortifications which predate the Late Preclassic period do not have all these features, while fortifications from later periods have a variety of additional features. Thus, in Mesoamerica, fortifications most consistent with those of Moroni in the mid-first century BC are those which date to that general time period. Similar fortifications are also known in pre-Columbian North America, although currently none in that region are known to date to Book of Mormon times. As the frequency and complexity of war increased, there became a greater need for the Nephites to fortify themselves against Lamanite attacks. Under these circumstances, Moroni did not settle for simple or basic fortifications. 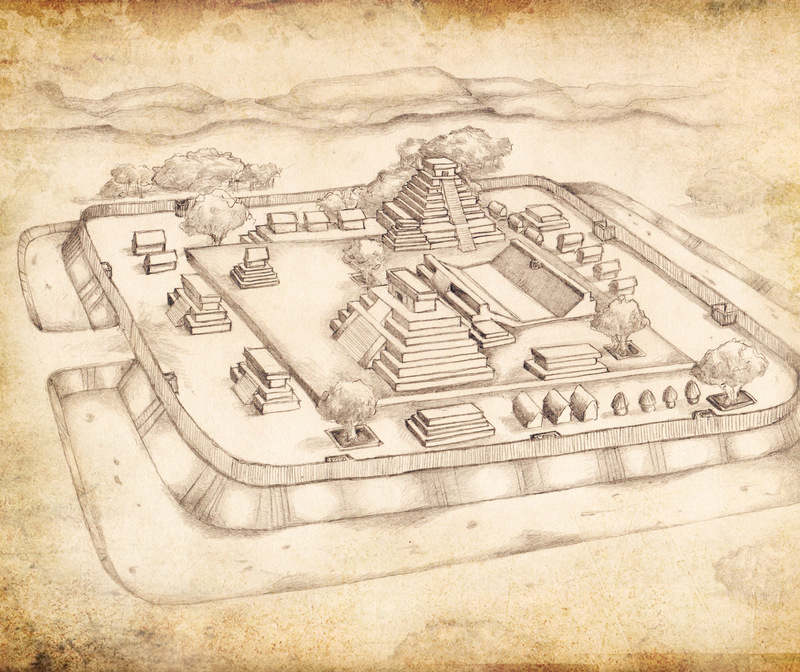 As LDS author and educator, John Bytheway, pointed out, “it wasn’t just heaps and timbers, but heaps, timbers, pickets, and towers that created places of security.” Comparison with the defensive features in contemporary Mesoamerica suggests that Moroni employed all the available methods of his time to protect and fortify his people. Today, the temptations of the Adversary grow subtler and more sophisticated. Following Moroni’s example, readers today can and should use all the available means to protect themselves against “the temptations and the fiery darts of the adversary” (1 Nephi 15:24). Elder M. Russell Ballard taught, “there is not one great and grand thing we can do to arm ourselves spiritually.” Instead, Elder Ballard explained, “True spiritual power lies in numerous smaller acts woven together in a fabric of spiritual fortification that protects and shields from all evil.” These include prayer, scripture study, and following the living prophets, who are the current “watchmen” positioned atop the towers. Each feature of our spiritual defense is designed to further ground individuals and communities upon the rock of Christ, the only true defense and refuge from evil, suffering, and temptation in this fallen world (cf. Helaman 5:12). David E. Spencer, Captain Moroni’s Command: Dynamics of Warfare in the Book of Mormon (Springville, UT: Cedar Fort, 2015), 20–32. John Bytheway, Righteous Warriors: Lesson from the War Chapters in the Book of Mormon (Salt Lake City, UT: Deseret Book, 2004), 59–67. John L. Sorenson, “Fortifications in the Book of Mormon Account Compared with Mesoamerican Fortifications,” in Warfare in the Book of Mormon, ed. Stephen D. Ricks and William J. Hamblin (Salt Lake City and Provo, UT: Deseret Book and FARMS, 1990), 425–444. See Book of Mormon Central, “Why was Moroni’s Young Age an Advantage? (Alma 43:17),” KnoWhy 151 (July 26, 2016). See Jacob 7:25; Jarom 1:7; Mosiah 7:10; 9:8; 21:19; and 22:6. See John L. Sorenson, “Fortifications in the Book of Mormon Account Compared with Mesoamerican Fortifications,” in Warfare in the Book of Mormon, ed. Stephen D. Ricks and William J. Hamblin (Salt Lake City and Provo, UT: Deseret Book and FARMS, 1990), 438–443 for all references to fortifications in the Book of Mormon. David E. Spencer, Captain Moroni’s Command: Dynamics of Warfare in the Book of Mormon (Springville, UT: Cedar Fort, 2015), 25–32 shows images of pre-Columbian forts from both North America and Mesoamerica, which are similar to the Book of Mormon descriptions. Ross Hassig, War and Society in Ancient Mesoamerica (Berkeley and Los Angeles, CA: University of California Press, 1992), 44. Interestingly, according to Hassig, the “increasing military professionalism” began ca. 400 BC with the spread of “specialized arms” (p. 30). Besides a few swords made by Nephi early on, it was in Jarom’s lifetime (ca. 397 BC–359 BC, see Jarom 1:5, 13) that the Nephites first began to develop “weapons of war” (Jarom 1:8). Hassig, War and Society, 32. Takeshi Inomata and Daniela Triadan, “Culture and Practice of War in Maya Society,” in Warfare in Cultural Context: Practice, Agency, and the Archaeology of Violence, ed. Axel E. Nielson and William H. Walker (Tucson, AZ: University of Arizona Press, 2009), 66. Sorenson, “Fortifications in the Book of Mormon,” 429, table 2. As is sometimes done by Mesoamerican scholars, Sorenson splits the Late Preclassic into two periods: the Late Preclassic (400–50 BC) and the Protoclassic (50 BC–AD 200). He documented 30 for the Late Preclassic and 26 for the Protoclassic. To avoid confusion, since all others I have cited do not follow the Late Preclassic/Protoclassic division, I have combined Sorenson’s numbers for the two periods and simply called it Late Preclassic. Since these numbers are from 1990, it is likely that there are now more from all periods of Mesoamerican history. Sorenson, “Fortifications in the Book of Mormon,” 430, table 3. See Hassig, War and Society, 37; David L. Webster, Defensive Earthworks at Becan, Camepeche, Mexico (New Orleans, LA: Middle American Research Institute, Tulane University, 1976), 14–15, 88–91, 94–97. Also see John L. Sorenson, “Digging in the Book of Mormon: Our Changing Understanding Ancient America and Its Scripture,” Ensign, September 1984, online at lds.org; John L. Sorenson, An Ancient American Setting for the Book of Mormon (Salt Lake City, UT: Deseret Book, 1985), 261–262; John L. Sorenson, Images of Ancient America: Visualizing the Book of Mormon (Provo, UT: FARMS, 1998), 132–133; Daniel Johnson, Jared Cooper, and Derek Gasser, An LDS Guide to Mesoamerica (Springville, UT: Cedar Fort, 2008), 101–103 (sidebar); Joseph L. Allen and Bake L. Allen, Exploring the Lands of the Book of Mormon, revised edition (American Fork, UT: Covenant Communications, 2011), 598–602; John L. Sorenson, Mormon’s Codex: An Ancient American Book (Salt Lake City and Provo, UT: Deseret Book and Neal A. Maxwell Institute for Religious Studies, 2013), 405–410. Again, this can be seen in Sorenson, “Fortifications in the Book of Mormon,” 430, table 3. For a fairly detailed treatment of fortifications in the Heartland region, see David E. Jones, Native North American Armor, Shields, and Fortifications (Austin, TX: University of Texas Press, 2004), 50–57, 125–135. Jones documented Native American forts in the Northeast and Southeast with earthen walls, palisades, and bastion towers. Scattered references to Mississippian fortifications can be seen in Charles R. Cobb and Bretton Giles, “War Is Shell: The Ideology Embodiment of Mississippian Conflict,” in Warfare in Cultural Context: Practice, Agency, and the Archaeology of Violence, ed. Axel E. Nielsen and William H. Walker (Tucson, AZ: University of Arizona Press, 2009), 88–91, mentioning palisades and ditches. Palisades, ditches, and bastions are mentioned in Thomas E. Emerson, “Cahokia Interaction and Ethnogenesis in the Northern Midcontinent,” in The Oxford Handbook of North American Archaeology, ed. Timothy R. Pauketat (New York, NY: Oxford University Press, 2012), 402; Gregory D. Wilson, “Living with War: The Impact of Chronic Violence in the Mississippian-Period Central Illinois River Valley,” in Oxford Handbook of North American Archaeology, 527–528; John E. Blitz, “Moundville in the Mississippian World,” in Oxford Handbook of North American Archaeology, 539. Many earthworks in the region, with ditches and mound like walls, have been mistaken for fortifications but are in fact not defensive sites. See Meghan C. L. Howey, “Regional Organization in the Northern Great Lakes, AD 1200–1600,” in Oxford Handbook of North American Archaeology, 292–295; George R. Milner, “Mound-Building Societies of the Southern Midwest and Southeast,” in Oxford Handbook of North American Archaeology, 438–440. Currently, the earliest evidence for fortifications in this region dates to AD 600–1000 (Jones, Native North American Armor, 125), while most evidence postdates AD 1000. According to Milner, “Mound-Building Societies,” 445, “The Middle Woodland decline in hostilities is likely real—that is, not a result of poor sampling—because many skeletons have been examined.” While the definition of Middle Woodland can vary between scholars, Milner defines it at ca. 200 BC–AD 400 (p. 437). John Bytheway, Righteous Warriors: Lesson from the War Chapters in the Book of Mormon (Salt Lake City, UT: Deseret Book, 2004), 60. M. Russell Ballard, “Be Strong in the Lord, and in the Power of His Might,” fireside given at BYU on March 3, 2002, online at speaches.byu.edu. See Ballard, “Be Strong in the Lord”; and Bytheway, Righteous Warriors, 59–67.